The first thing you should decide on when you are looking for a new toothbrush is about the type of toothbrush you are going to get – manual or powered. 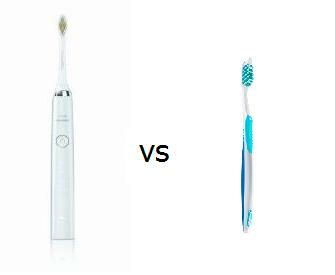 To ensure that you will make the best choice now I will shortly describe electric toothbrush pros and cons. There are dozens of rechargeable electric and manual models available on the market, packed with all the bells and whistles you can imagine. And every manufacturer is claiming that he has the best brush on the market. It is so easy to get lost when you are shopping for such a simple thing as a new toothbrush. Deciding whether to buy a manual or electrical model basically comes down to what you desire as far as comfort and convenience go. Whatever dental care tool that you decide to buy remember that using your tool is what counts. Yes, the best toothbrush that you can buy is the one that you will actually use. Again. And again. Every day. That’s it. It’s really that simple. While both powered and regular brushes have some advantages, and drawbacks, the bottom line is which one you will use. At least twice a day for two minutes. Usually, have larger ergonomic handles which are easier to use for people with pain in their hands and arms. If you want to learn more about power toothbrushes, check out our list of best electric toothbrushes or explore the product lines of OralB and Philips. You have finally decided that powered model is the way to go, and you are looking for the best product that will suit your needs. There is a wide range of types of power toothbrushes in existence from reputable manufacturers like Philips and OralB and finding the right one for you can be a difficult task. That is why it is helpful to keep a few criteria in mind when you are choosing your new item. Automatic models, just like manual toothbrushes, have different sizes of brush heads. In general, the smaller the person, the smaller his mouth, the smaller the brushhead needed, although there are apparently exceptions to be made to this rule. People with braces should also use smaller heads. When shopping for a power toothbrush, remember that you will have to change the replacement heads at about the same frequency that you would replace a manual toothbrush – usually every 3 months. Before you commit to a particular brand and model, make sure that the replacement brushes are available in your area. Although you are sure to notice the price of the actual power brush, don’t forget to factor in the cost of heads. Some models have chargers that are compact, easy for travel, and take up less space. Others might have larger chargers or chargers with a place to hold extra brush heads. Many electric brushes have built-in timers, either to measure the who minutes recommended for brushing all of the teeth, or in 30-second increments for each quadrant of the mouth. Some of the more advanced models have multiple modes and different power settings for different situations, for example, sensitive more for people with sensitive gums. Another feature that is quite rare is bundled UV sanitizer. Even toothbrushes from the reputable manufacturer, just like any device with mechanical and electronic parts, are prone to possible problems. Make sure your unit has a warranty and that you keep all of the paperwork. When you have a clearer picture of what you need and want, you should check out our comparison guide.